In short: A top-of-the-line sport cabriolet. Revamped for 2009, Mercedes-Benz’s iconic SL63 AMG roadster is an inviting and handsome ride, complete with sharp aerodynamic angles, 19-inch wheels, a trunk-lid spoiler, and styling accents evoking the 1954 300SL “Gullwing.” Under its hood is a menacing 518-horsepower naturally aspirated V8 engine, capable of launching this two-seater to 60 mph in only 4.5 seconds. Along with its Herculean powerplant is a seven-speed automatic transmission with four shift programs, including Comfort, Sport, Sport Plus and Manual. Gears can be selected via the steering wheel’s mounted shift paddles. 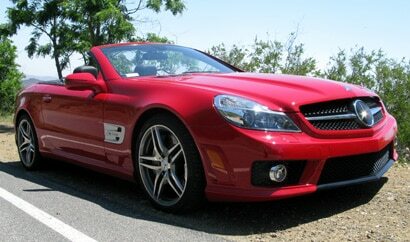 While true the SL63’s price is in the six-figures, it’s hardly surprising for such a high-energy luxury sports car. This lithe convertible is equipped with a quick-folding power hardtop, and can while its top is down, keep its riders comfortable in chilly weather thanks to an available Airscarf feature, an extra heating system that blows warm air from vents in the seating’s head restraints. Inside our test vehicle were twelve-way power-adjustable/heated sport seats along with premium leather upholstery. Other standard creature comforts included a Bluetooth interface, a 40-gigabyte navigation system, and a ten-speaker audio system with Sirius satellite radio, an iPod/MP3 media interface and six-disc CD/DVD changer. Active ventilated seats, an electronic trunk closer, and a panoramic sunroof are all optional.